What can you do when you’re trying to get through to that one person in your crew who just doesn’t seem to get safety? You’ve brought out the facts and figures. You’ve laid bare the truth about the safety legislation. You’ve pointed out the things that affect your people for a lifetime if they don’t think safety when they’re working. And still, nothing changes? Maybe you’re giving them the wrong information or missing what it is they want to hear from you. Maybe you’re asking the wrong questions. Or, are you asking a question at all? When it comes to wanting so badly for our people to get with the safety program, it’s easy to fall into the trap of making statements instead of asking questions. After all, you have the data, documents, and even a few well-placed and well-rehearsed clichés to throw into the mix as well. But what if your people didn’t care about the data, the documents, and they rolled their eyes when the clichés fell out of your mouth? What then? When you are armed and ready to correct the inaccuracies of safety, you tend to lead with statements. With every employee excuse for resisting safety protocols, you can rebut it with a statement of fact and accuracy. That’s because you are armed to correct the fallacies and misinterpretations of safety. But, it’s in how you present it that makes a difference. When you make statements in trying to get your message across in safety, your statements are not taken by your people as fact. A quick jump to correct an inaccuracy is likely to be interpreted as lecturing. Nothing, and I mean nothing, will shut down an employee’s willingness to listen to what you have to say faster than for it to appear that they are being lectured to. When you make a statement, without first inviting them into a conversation, you are lecturing. When you lead with a question though, you are inviting a conversation. You see, there is no such thing as a one-way conversation. A one-way conversation is a lecture. To ask a question is to invite a response. That is the basis of a conversation. To ask an employee what they like about the job creates a conversation. To ask, what part of the safety program they have difficulty with creates a conversation. To ask, what parts of the job an employee does best creates a conversation. You don’t get anyone’s attention by starting with a lecture, or preaching rules, or scolding about safety. Without their attention, you are never going to get their engagement. And if you don’t have their engagement, you don’t have their commitment to safety. And as much as safety people talk about intervening in a task, if the only time you “want to have a conversation” is to correct the thing that they’re doing wrong, it’s not perceived as a conversation. It’s still a lecture. If you want to help your people to become more effective at safety and to buy-in to the safety program, they have to first buy-in to you. And no one buys-in to you because of your title or position. Your people buy-in to those they trust, they respect, and those who listen to them, hear them and care about them. You have to treat them with respect, and certainly give a damn about who they are and the contribution they make. So, consider this idea: if an employee was valuable enough to hire, they should be valued enough to get your best. Are you giving them your best when it comes to creating conversations that matter, that get responses and that help to overcome their resistance to safety? Or are you running a never-ending series of one-sided lectures? Stop yourself before you quick-draw that fact or cliché and ask yourself: is what I am about to say going to create a conversation and create trust? If not, how can I do it in a way that results in us having a mutually-respectful conversation? 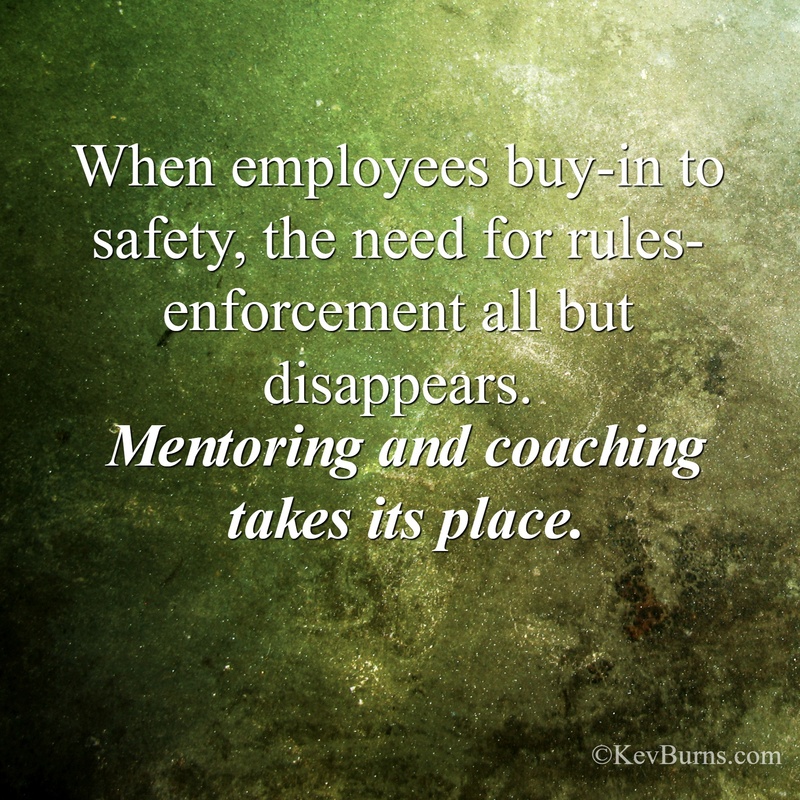 Kevin Burns is a management consultant, internal safety communications strategist and author of PeopleWork: The Human Touch in Workplace Safety.